Thanks for the detailed description of why pheromones work. I had always wondered why a regular insect trap didn't work for moths. Turns out science helps us more than we know. Originally moth traps were not much different from any other insect traps. They were a simple glue board (cardboard with always sticky glue covered in a wax release paper). Using the old style moth trap glue board the moth control strategy was to place the moth trap glue board in an area where a moth could fly into the board and be trapped by the glue. This style moth trap did catch moths, but it was a function of chance that a moth might stumble into a trap. It’s easy to recognize this style moth trap because it won’t have any separate moth trap lure that comes in a separate packet. Every species emits chemicals called pheromones to communicate the desire to mate. Over the last 50 years, moth pheromones have been the most studied of insect pheromones. In 1959 scientists were able to create a synthetic pheromone used by female moths to attract a male moth for mating. That changed everything about moth traps! Now a moth trap consists of a glue board, and a moth pheromone square that is opened and placed in the moth trap. These Moth Pheromone Traps are essential to the “mating disruption” moth control strategy. 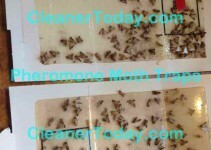 What results can be expected when using pheromone moth traps (like catchmaster moth traps)? Not every moth you see flying is a male moth. Female moths are not attracted to the pheromone, and will not be interested in the moth traps. So yes, you could actually see a moth fly right past the moth trap, but it doesn’t mean the trap isn’t working. Only that you saw a female moth fly by. Everyone wants the problem solved immediately, but when it comes to moths, the real issue is how fast they can reproduce. 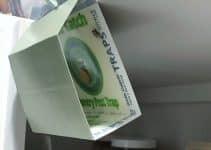 To future generations of the moth infestation is the main benefit of the pheromone moth trap, because trapping male moths, means fewer female moths can lay eggs. 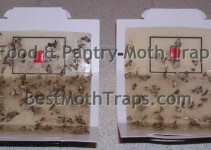 The 2-4 week net effect is a reduction in your moth infestation. Carolina Moth Traps Save dog food.